Widow of the late Kaduna State Governor Patrick Yakowa, Amina, said in Kaduna on Sunday that her worst regret was not praying with her husband before he embarked on his last journey to Bayelsa State on Saturday. Amid sobs, Amina narrated how her husband left the house on Saturday without the usual ‘prayer of agreement’ and how they had planned to meet in Abuja for a thanksgiving service for President Goodluck Jonathan’s wife, Patience. She told the congregation at a church service organised for the late governor inside the Sir Kashim Ibrahim Government House that, “Everyday, we normally hold our hands to pray before he steps out of the house to the office. But on Saturday, when he told me he was leaving for Bayelsa State. I just bid him farewell and we said we would meet in Abuja for the thanksgiving ceremony of President Goodluck Jonathan’s wife, Patience. I regret that we could not pray as usual. After that he came down and left for Bayelsa. She said she could not pray for her husband on Saturday because she was down with catarrh. “We planned to meet in Abuja today for the thanksgiving service of the President’s wife. He (Yakowa) had been a pillar of support to our family,” she added. Yakowa; ex-National Security Adviser, Gen. Andrew Azazi , and four others died when a Naval Augusta 109 Helicopter in which they were travelling crashed in the Nembe-Okoroba in Bayelsa State. They were returning from the burial of Pa Douglas, the father of an aide to Jonathan, Oronto Douglas. Other victims of the crash were Yakowa’s special adviser, Dauda Tsoho; Azazi’s bodyguard, Warrant Officer Mohammed Kamal; and two naval pilots – Commander Muritala Mohammed Daba and Lt. Adeyemi O. Sowole. The traditional ruler of Kagoma, Col Paul Zaka Wyom, said he would never forget his last encounter with the late governor during the just concluded council poll which incidentally took place on Yakowa’s birthday. Wyom said, “It is very difficult to give a full description of the governor. The last time that I saw him was during the Local Government election in the state on December 1, 2012. That was the moment that I will never forget in my life. Also on Sunday, the President-General of the Southern Kaduna Peoples Union, Dr. Ephraim Goje, narrated how Yakowa visited his parents’ grave barely 15 days before he met his death. Goje said, “One of the last encounters I had with him that I will never forget happened on December 1, 2012 which was his birthday. If you remember, he also conducted the local government elections on that day. At about 1 pm, I called him to congratulate him on his birthday and for successfully conducting the local government elections. “He said to me, my president, as I speak to you, I am standing by the graveside of my parents. I have not had the opportunity to come here in the past two years and I am using the opportunity of this elections to come to their graveside. “He said further that he will surprise the people of Kaduna State when he presents his 2013 budget and that through the document, the people of the state will know that he meant business. I told him that wherever his parents were, I am sure that they would be proud to have him as their son, especially rising through the ladder to be the governor of the state. We are also proud of him and his achievements. 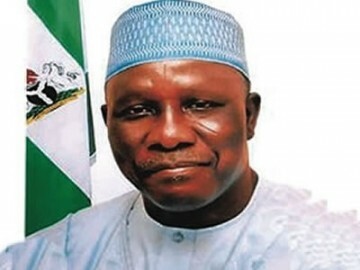 Goje said the death of the governor came to him as a surprise, noting that with the loss of a “great son” like Yakowa, a big vacuum had been created in the state. “The death of Patrick Ibrahim Yakowa came to me as a surprise and with great shock. I want to say that Kaduna State has lost a great son and a big vacuum has been created. He was a man with a passion to develop Kaduna State. There were no religious or ethnic considerations in his actions and he was dedicated to the development of the state,” he said.